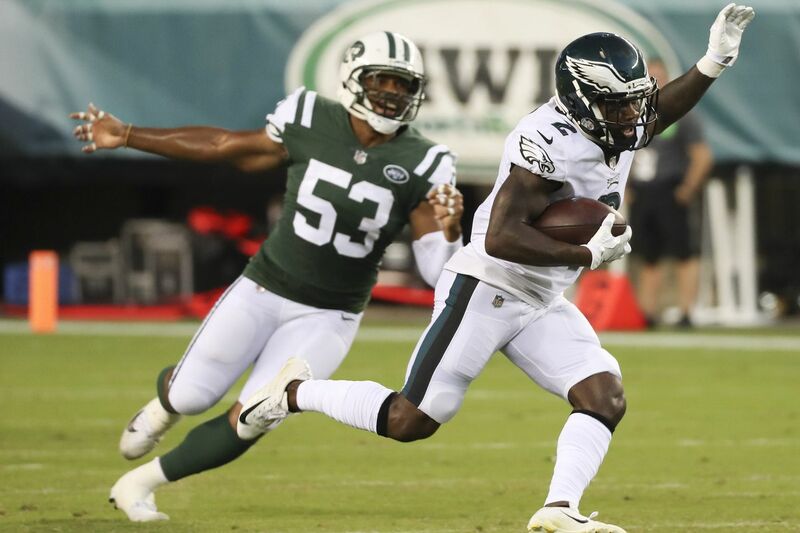 They saw Carter gain the Eagles' first two first downs of the game against the visiting New York Jets, on catches of 19 and 18 yards in an Eagles 10-9 victory at Lincoln financial Field. Later in the first half, he couldn't come up with a poorly placed Christian Hackenberg throw, which was a hard one for the unofficial scorer in the press box – not a good pass, but when you're trying to make a roster, they kind of expect you to catch everything. "I've had better games. We'll see how it goes," Carter said afterward. He ended the preseason second on the team with 10 catches for 178 yards. "Made a couple of plays. Wish I could have made a couple more." Carter has generated good buzz, after joining the roster a couple of days into training camp. He had missed all the spring work and had to learn the offense on the fly. Going into Thursday, he'd caught seven passes for 121 yards in the previous two games, games in which very little else went right for the Eagles offensively. Carter has four catches of 20 yards or more, and he zipped 29 yards on a punt return last week at Cleveland. Thursday, he was back to return punts and kickoffs, but never got a great return chance; his only punt return went for 9 yards. "I wish I could have made a bigger impact in that area, of course, but it happens how it happens," Carter said. Carter is 25 years old. He's been a member of practice squads in Oakland, New England and San Francisco. His first training camp, with the Baltimore Ravens, was back in 2015. Carter knows not to get his hopes too high. To make a team, you have to fit a specific need, especially when the organization didn't invest a draft pick in you. "People don't make teams for a lot of different reasons," Eagles defensive coordinator Jim Schwartz said this week, when asked about the pain of the cut-down process. "Whether it's not a good scheme fit, maybe a numbers position, or maybe an injury. It's very rare that a guy just flat out isn't talented enough. I mean, that certainly happens, but perseverance is a big thing." Carter has persevered; he spent the entire 2017 season on the 49ers' practice squad without getting a roster shot. He vowed Thursday night to keep trying, even if what he called his best training camp and preseason doesn't work out. Working against him is that he is competing against several receivers with similar size (Carter is 5-foot-8, 190 pounds) and skills. There's Rashard Davis (5-9, 175), Markus Wheaton (5-11, 185), Tim Wilson (5-9, 170), and Greg Ward (5-11, 186), who made a highlight-film-quality catch Thursday night. Working for Carter is that he has outproduced all of those guys. "You can't necessarily control whether the team keeps you or not. It's a lot of variables to it. But you go out and you put the best performance you can on the field, and let the rest take care of itself," Carter said. Carter is easy to pull for; you might have heard about how he promised his late brother, Kaylan Carter, that he would make the NFL, as Kaylan lay dying, stricken by a heart problem. Or about how he served as a long-term middle school substitute teacher in Hayward, Calif., after the Patriots released him following the 2016 preseason, Carter unable to find even a practice squad berth the rest of that year. He was in a similar spot this May when the 49ers released him; no training camp invitations were immediately forthcoming. "I didn't know I was going to get picked up here," Carter said. He added that his faith kept him from obsessing, that he figured if he was meant to get another chance, he would. "He's done a really good job," offensive coordinator Mike Groh said this week. "He's a guy that we added in training camp, and I'm glad that he's here. He certainly has put himself in a position to be competitive for a roster spot." It will be interesting to see how the Eagles address wide receiving in the cut downs. Alshon Jeffery hasn't practiced yet, certainly isn't going to be ready for the opener. Mack Hollins hasn't practiced much lately and hasn't played since the preseason opener. Ditto Wheaton. Does the team need to keep an extra wideout or two, to cover for the injured? Carter could make the team this weekend and be off it in a week or two. But that would be more roster time than he's ever gotten. "Just hang out," Carter said, when asked how he'll pass the time waiting to know if he's on the team. "My girlfriend's in town. Probably spend some time with her. Try not to think about it, hope my phone doesn't ring."